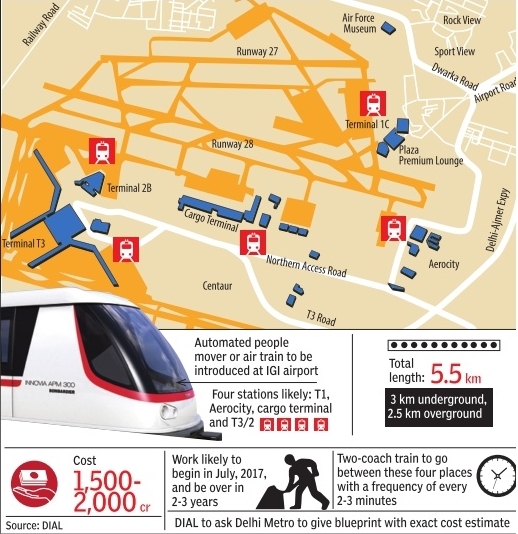 The IGI airport will soon get its own air train, a dedicated Metro, for passengers to transit from one terminal to another. Leading airports of the world like New York's JFK, London Heathrow, Hong Kong and Zurich have long had free-to-use Metro lines between their terminals and Delhi will be the first Indian airport to boast of the same. At present, passengers transit between terminals by buses. DIAL is going to ask Delhi Metro Rail Corporation to do a technical study on the routing and also give an indicative costing of the air train project. The airport operator has held initial consultations with a New York-based firm. Based on that, the plan is to have four stations for its air train -at T1, Aerocity (the hospitality district), cargo terminal and a common one for T3 and T2/4.